The Hubble Space Telescope (the HST) is a reflecting telescope with a 2.4 metre diameter primary mirror that was launched into low Earth orbit in 1990. Over a quarter of a century later, the HST is still one of the most important astronomical instruments available to us. The advantages of the HST over a ground-based telescope are mainly due to its position above the Earth’s atmosphere. The effect of atmospheric turbulence is what causes stars to appear to twinkle, to an observer on Earth, and must be compensated for by a large ground-based telescope, using techniques such as adaptive optics or aperture masking interferometry. “Skyglow”, from light scattered by the Earth’s atmosphere, is also a problem for ground-based telescopes, which does not affect the HST. Hubble’s primary mirror is quite small in comparison to the 10-metre mirrors of the two Keck telescopes on Mauna Kea in Hawaii, for example, which can produce higher resolution images of bright objects than Hubble can. However, because Hubble is above the atmosphere, it is particularly good at imaging faint astronomical objects at high resolution, such as distant galaxies. Because of this ability, the HST played a critical role in the precise determination of the Hubble constant and hence the age of the Universe. both the Hubble Space Telescope and the Hubble constant are named after Edwin Hubble, whose observations suggested that the Universe is expanding. The atmosphere is also opaque to most wavelengths of electromagnetic radiation outside of the visible spectrum and some radio wavelengths. Above the atmosphere, Hubble can be used to produce images in both the infrared and ultraviolet parts of the spectrum, as well as visible light. Another advantage of the HST is that it can observe any part of the celestial sphere, whereas a ground-based telescope has a fixed position on the Earth’s surface and, therefore, can only observe the sky that is visible at the telescope’s latitude. This is why it is an advantage to build a large telescope near to the equator, where almost the entire celestial sphere will be rotated into view, throughout the course of the year, as the Earth orbits the Sun. When the HST was launched in 1990, it was discovered that the primary mirror had been manufactured to the wrong shape. Although the mirror had been very precisely ground, it suffered from spherical aberration, due to a misaligned mirror in the optical device that had been used to test the mirror’s shape. This problem caused images from Hubble to appear blurred and out of focus, which severally limited Hubble’s usefulness. This problem was fixed in 1993 by a Space Shuttle mission to install a corrective lens, known as the Corrective Optics Space Telescope Axial Replacement or COSTAR – a bit like fitting the HST with spectacles. 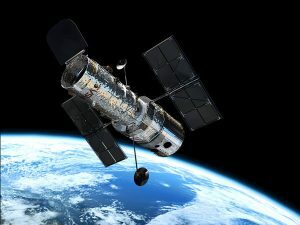 This meant that one of Hubble’s instruments needed to be removed to make room for COSTAR. However, by 2009, each of Hubble’s other instruments had been replaced with upgraded versions that included in-built corrective optics, so it was then possible to remove COSTAR to make room for another instrument module. The Hubble Space Telescope could remain operational for a decade or more, but its successor, the James Webb Space Telescope (JWST) is due to be launched in 2018. The JWST will feature a 6.5 meter segmented mirror and will be positioned near to the L2 Lagrangian point on the opposite side of the Earth from the Sun.